When you hear the brand KTM, the first thing that comes to mind are their off-road options. 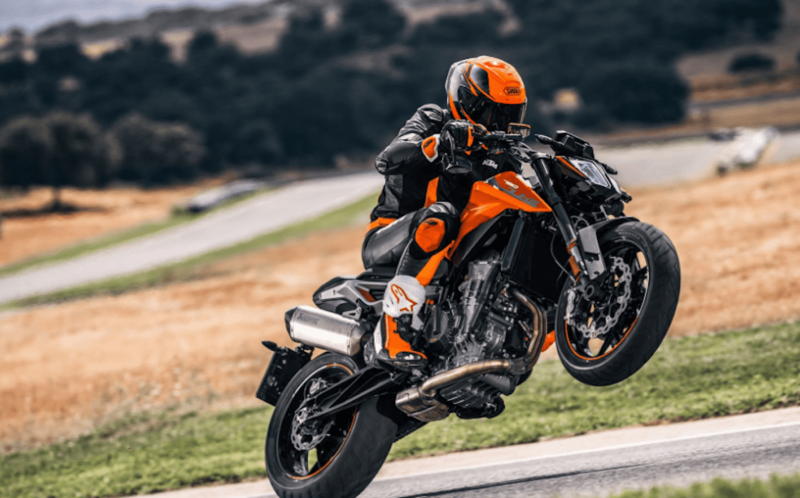 And while KTM is familiar with the standard motorcycle forte, KTM has been dipping their toes into other flavors of riding, which can be seen with bikes like their Super Duke.Every new arrival further proves that KTM is not a brand to diminish, and could really make waves within the industry. This point is even bolder with their new bike launch, the 2018 KTM 790 Duke. While the naked motorcycle is available in Europe, it still isn’t available in the U.S because of logistics. Yada, Yada, details, details. I just want to know when we can expect it here, and how it will do in our marketplace. The first impression of this ride? It’s slick, has artistically clean lines, and looks like it means business. Maybe this bike style isn’t really your thing, and that’s okay. But I think everyone can appreciate a cool-looking ride when they see one. So, with that, this is one cool-looking ride. It’s sporty but still manages to hold its own because of the design. It looks like it’s got one foot in off-road territory, but seems like it’s inspired by past adventure bikes, too. It’s a love child, and I like it! It has a parallel twin engine instead of a current crowd favorite, which is a V-twin. This was to help with the bike’s look, design, and cost. This bike weighs in at 383 pounds, and to say that it’s a fun ride because of its flat torque would be just a bit of an understatement. You can hit 100 mph very quickly (not that I’m saying that you should), but it’s the thought that counts, right? This bike is going to be an excellent option for those who really prioritize speed because it doesn’t have an issue with hitting it. It’s a short bike, as well as a light one. It’s effortless to handle, and when you have a ride that loves speed as much as this one, that’s a priority. Because of its size, many might think that this is a bike that can only handle smooth pavement. However,it has the ability to tackle a variety of different road variations and won’t slow when you start hitting some questionable roads. It has ABS, which seems to be a default in today's industry. And while it might not have the look of a common, everyday ride (but, really, what does?) it’s a more logical option than others would assume. It has a 3.7-gallon tank, which can handle about 150 miles before having to be filled again. The 790 Duke is an awesome ride for different heights, too, which wasn’t originally expected. Because of its light frame, it could be assumed that this bike caters more to those who are smaller in height and structure. However, it seems that taller riders don’t have any difficulties with this bike, which should provide a thumbs up in the versatility sector. It has the LED lights you would expect it to have, along with an illuminated menu, but it doesn’t try to over complicate things. It’s easy to customize, which means that if you want to add some KTM luggage options for the longer rides, you can. Sure, the seat might not have the comfort of a throne, but it’s surprisingly comfortable. The parallel-twin engine can produce 103 hp, and 63.6 pound-feet of torque. It’s a bike that doesn’t mess around, and the most significant potential selling point is its price. There’s no set decision on how much it will go for here in the beautiful US of A, but if its price in Europe can shed any light on what its price could be here, it’s expected to be in the mid $10K. If there’s one area that this bike is sure to shine, it’s with the millennial audience. It’s a sporty looking bike that can be customized for longer rides, has no issue with gas, and comes with a price that could be considered easy on the wallet. I believe the more bikes, the better. And while everyone can have a special place in their heart for the American brands, it’s always fun to appreciate the competition in the market. The one thing that’s for sure? If KTM continues to provide us with bikes like this one and starts to dip their toes in other riding styles, they will be a force to be reckoned with.